A peaceful direct action by disabled people and older people at Sheffield train station against South Yorkshire Transport for revoking free travel from March 31st has been marred once more by aggressive police actions. There have been peaceful direct actions since April. 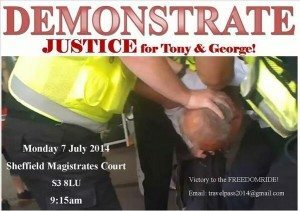 Sixty protesters took part on 23rd June two were arrested and a blind freedom rider was knocked about falling on top of an activist in a wheelchair. George and Tony who were arrested are in court in Sheffield on 7th July. Jen Dunstan, of Sheffield Disabled People Against the Cuts, told the Star: “Dozens of elderly and disabled people have been left with bruising. Some have cuts where their skin has broken from being pushed and shoved. A Sheffield Star reporter was also warned to stop filming or he would be arrested under ‘anti terrorism laws’ by railway staff. Temporary pay pal account for the freedom ride campaign fund. See video and you decide what form of justice is being used…. Excessive behaviour from the strong arm of the law. Does the LAW not recognise that DECENT senior citizens do DESERVE to be heard at any cost.